This spread came together really fast after I came upon this quote: Tea is quiet and our thirst is never far from our craving for beauty. Some scraps of mulberry paper made excellent grass and the tea tag flower pots worked for me with their flower stems. The clouds are fabric with puffy paint around the edges--I salvaged them from an old shirt project. I used a piece of washi tape down the middle which I see is going to need some glue help to stay down. I bought a turquoise bed sheet and used that to back the quilt. I decided not to tie it together after all and stitched by machine around each block to keep the layers together. To finished it off, I rolled the edge to the front, turned it under and sewed it down for the binding. In this close-up you can see the appliques I added here and there. The fishy in the top left corner of the bottom right block actually hides a stain that I could not get out. Hi everyone! We certainly are getting "paid back" for the warm weather we enjoyed back in December and most of January. The last few days we have had single digit weather with wind chills well below zero! It is hard to get moving on cold days like that, so not much has been going on around here. I did manage a page in my Tea Journal which lets me stay in touch with the tea group. so I rubbed the images on a separate piece of paper, cut them out and added them to the steam. I thought I didn't have enough swirls so I drew some as well as the musical notes. On the other side I added the rub ons directly to the page as well as some music notes that I stamped on stickers but had to glue down anyway. I used a calligraphy marker to write the quote, "Tea is to the body as music is to the soul". My goal today is to try and get the quilt finished! I hope you have a great day and thanks for visiting! Thank you for the kind comments and suggestion. I have now linked up with AJJ in! Double chocolate chip walnut cookies! I'll be enjoying mine right after lunch with a cup of this delicious green kiwi tea! I think I am becoming a "tea snob" because ever since I discovered the taste of full-leaf tea....I don't think I can ever go back to dunking a bag. Do the tea drinkers out there have a preference? I have found that I really need to just get off the computer for awhile if I want to get anything done, and I am still attempting to be a "working" artist, so apologies for not being such a regular visitor last week. I am finishing up my T shirt quilt and thought I would show more photos and explain about the lettering. Here it is with all the connectors cut and removed--certainly easier to read. I even added our names and wedding date at the bottom. Some people asked about my machine and if it is computerized. Well, yes, but not really in a fancy way. He has decorative stitches and letters built in--no dies and no other symbols can be added. The charts on the right side of the machine list the symbols the machine can make & have a number above it. At the top of the machine you will see a screen and some buttons. You use the button to enter the correct numbers. Sounds simple, but it is really easy to get confused or enter the wrong code, or even forget to add a space. So I was quite proud that with all those line of stitching, I only see one spacing error which didn't look bad enough to correct. This is where I am right now! 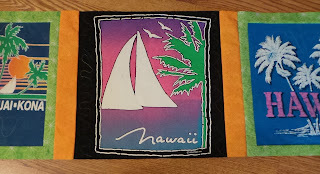 I have some tropical appliques that I am thinking of adding before I back the quilt. They are good for covering up the odd stain or two on the shirts that just would not come out. I hope to be finished by next week so I can move onto other projects. I appreciate you stopping by and all the kind comments I have received. Happy T Day! We were well prepared and since we did not need to go anywhere, I had lots of time to play with my art supplies. I did a page in my altered tea quote book that I am sharing with Elizabeth for T Stands For Tuesday--a weekly link up where we share what we are doing and something drink related. I have started to do the stitching on the white square. It will be filled with the lyrics to our wedding song which was "Can't Help Falling in Love" by Elvis--big surprise, huh?! Anyway, I'm using variegated thread--a different but complimentary one to what I used before. Each letter has to be entered on the sewing machine one at a time, so it is pretty slow going. When I am all finished, I will clip all the connecting stitches and threads and show you again. It will be much easier to read. Lastly, I needed a new project while watching TV at night, so I started a scarf with a herringbone pattern. I chose black and red instead of the more common black and white. It will take me awhile since you change color every row, but so far I am enjoying making it. Hope you are all safe if you were in the path of the snowstorm! Happy T Day and thank you for stopping by! Hi everyone! I decided that I needed to learn how to just play and create something without having a purpose--I am trying to learn to be freer in my art. As most of you know, I am primarily a beader--more specifically, a maker of french beaded flowers. There are very distinct steps in that craft and although there is a lot of leeway with respect to colors etc., there isn't too much variation necessary to craft a life-like flower. So, while I am waiting for the first snowflake to fall, I pulled out one of my UFOs which now done, I think I should have just launched into space. No really. You should have seen it before I worked on it some more. After the background was painted, this was completed all with foam stamps. I masked out the cabin to do the trees green and then lightly stamped the image of the cabin. I painted over the cabin and added the door--whoever heard of a cabin without a door? Silly stamp! I added some white to the trees and added their trunks. Stamped the snowflakes and then restamped and embossed them because they were still blah. Still didn't love them, so I drew around them and added the quote from Albert Camus, "In the depth of Winter I finally learned tht there was in me an invincible summer". So much for playing, but at least I can turn the page in my journal and go on! The weather forecast for my area is either a few inches or 8-10 inches--they are having trouble deciding; however, it is more of a southern storm and I predict the lesser amount. If you are in its path, please stay safe and home if you can! Happy Weekend everyone! Hi everyone! Another Tuesday has rolled around and I am sharing my drink with Elizabeth and Bleubeard (and Squiggles of course). This is an example of the free motion quilting I decided to do. I used a variegated thread which I really liked because it brought in some tropical color. It was fun but a little stressful at the same time, because it is really hard to get the stitches an nice even length. What helped a bit was that my sewing machine has a speed control, so I could "floor the pedal" but it would only go so fast. Gave my brain one less thing to coordinate. Is this making you dizzy? I guess the hands were shaky this morning, but I basically wanted to show the colors, not the stitches. I started adding the sashing strips which as you can see are orange. I have all the blocks put together except for the top row. Remember that blank block still needs the words. I've been procrastinating starting that one because I know it is going to be very tedious, but cool in the end. Here is a little closeup to see how I handled more of the stitching. I basically just went around the block if I could or else just in the free space so I avoided stitching over any of the designs. 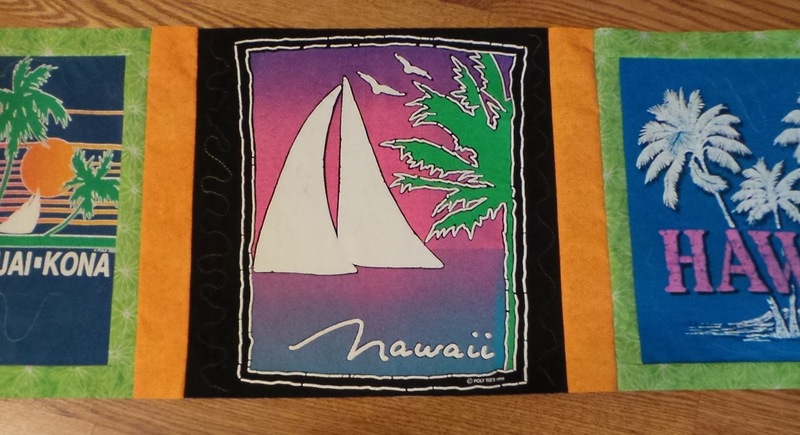 Some of them are silk screened and some are a little raised like the palm trees in the one on the right. Well, I had better get going now. I'll be around to visit everyone late today. Have a Happy T Day! Hi Everyone! I know, don't faint--two posts in the same week! Thank you all for the lovely comments and suggestions on my quilt post. I'll show what I finally decided on Tuesday, but today I had time to just play around with a little collage. It fits the Art Journal Journey challenge this month so I am linking up. It is hosted by Chrissie who chose as the theme, Winter Wonderland. Since we had our first little dusting of snow (which is mostly gone now) inspiration came a little easier. crocheted him some branchy arms, and added some blue highlights with spectrum noir alcohol marker on the ribbon and painted background. I really had fun just playing around today. Thank you Chrissie for the inspiration! Hi! My name is Debbie. Wife, Mom to one beautiful daughter, Artist & Designer. I am obsessed with seed beads and create French Beaded Flowers, butterfly & dragonfly plant sticks, beaded home decor items, beaded jewelry, and bead embroidery items. I also enjoy making ACEOs and working with polymer clay--especially finding ways to combine it with beads! Thank you for stopping by my blog; I hope you will enjoy your visit and come again! This is a Flickr badge showing public photos from craftymoose. Make your own badge here.